Rachel Benke suffers from epileptic seizures, and Taxi has been her constant companion for the past four years. Golden Retriever–Labrador Retriever mix (perhaps better known as a Goldador) Taxi was supposed to be a guide dog. He has the temperament, he has the intelligence, and he went through the requisite training. But when it came time to meet a cat, Taxi’s career as a guide dog was over before it started, San Antonio, Texas resident Theresa Benke tells KENS5 News. But one guide dog program’s loss became one little girl’s gain. Theresa’s daughter, Rachel Benke, had suffered with epileptic seizures since birth, and has even undergone two brain surgeries because of her condition. Fortunately, Rachel has shown improvement over the years, going from nonverbal to verbal, from eating baby food to solid food. Four years ago, when it came time to discuss the possibility of getting a service dog for Rachel as she entered school, Theresa admits she was a bit nervous. “We were very overwhelmed because of that time Rachel was afraid of animals,” says Theresa. But Theresa’s apprehensions melted away during Rachel’s initial meeting with Taxi, the dog who would become her daughter’s best friend and constant companion. Taxi accompanies Rachel everywhere, and is right by the young girl’s side each day at the North Side Independent School District (NSID) Middle School. One day, when Rachel was on the school track with her classmates, Taxi knew something was wrong. In a state of desperation, Taxi wriggled away from Rachel’s school aide and ran to the soon-to-be-8th grader’s side. As Taxi reached Rachel, Rachel had a grand mal seizure. “I don’t know how Taxi knew this but he wouldn’t let anyone near her until the paramedics arrived,” Theresa says. Taxi’s heroics did not go unnoticed by Rachel’s classmates, her teachers, or the administration at the school. In fact, the loyal Goldador became a staple at Rachel’s middle school. “Last year I joked about it when their yearbooks came out and I said, ‘hey where’s Taxi’s picture?” Theresa says. 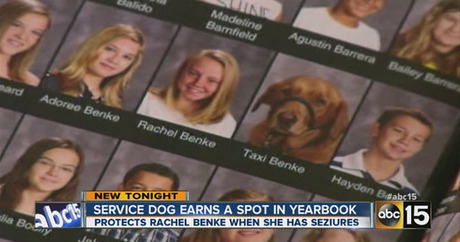 Apparently, the school district agreed, and this year, in the NSID Middle School yearbook, Taxi’s photograph is posted right next to Rachel’s — a fitting tribute to an amazing dog.